Fifty years ago, small steam engines were part of everyday life. They have now all but gone. The theory and practise of reciprocating steam engines are no longer taught to engineering students, and few mechanics could repair them. The knowledge held by engineers of the age of steam is rapidly fading, and elderly textbooks are no real substitute. Yet the basic principles are still valid and the mechanical skills needed to make, repair or restore them are within the abilities of many amateur model makers, as well as professional machinists. This book deals with the principles of steam power, from basic thermodynamics through to the mechanical details of pistons, cylinders and valves. Throughout, examples are given from the author's experience and wide knowledge of the literature. It provides that basic link, so hard to acquire except by personal contact, between the theory of the textbook and the constructional details of the engineering drawing. 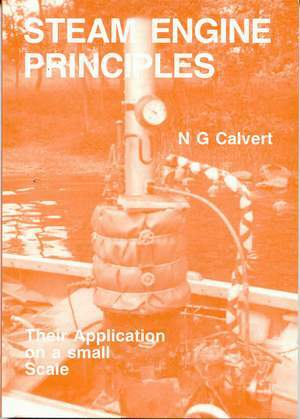 NG Calvert served an engineering apprenticeship, and then spent many years at the University of Liverpool passing on his enthusiasm for all things mechanical to generations of students. His particular enthusiasm for water, steam, boats and wind comes through strongly in this book.